I have such exciting news. A few days ago our author Terrie Farley Moran spent a morning at the Fort Myers Beach Library talking about US. Can you imagine? People who live on Estero Island and San Carlos Island and even a couple of folks from surrounding communities came to learn about the Read ’Em and Eat Café and Bookstore. They had questions about me, Bridgy, Aunt Ophie, Skully, our book club members, our favorite news reporter Cady Stanton, and our two Sheriff buddies, Ryan Mantoni and Frank Anthony. Well, I’ll admit Frank is not always a buddy, but he does have great shoulders and his smile crosses my mind a bit more than it should. The idea of having a library on Estero Island in Fort Myers Beach was originated by a woman named Ruth Healy in 1954 and she asked that the Beach Women’s Club come up with the money to get it started. In 1955 the Fort Myers Beach Library opened in this cottage that was so small, according to the library website, if more than five patrons entered at any one time, the librarian had to step outside. You can read about the history of the Fort Myers Beach Library here. Today the library is a three story wonder. The new construction is finally finished and the building looks like this. Anyone getting off the elevator on the third floor, which holds the meeting rooms, is greeted by a beachy decorated area where these three live. If by chance you come to visit Fort Myers Beach, after you’ve stopped in in the Read ’Em and Eat for sweet tea and Miss Marple Orange Iced Scones, I am sure you’ll want to spend hours exploring the Fort Myers Beach library for both its collection and the fabulous décor. And to celebrate this fabulous visit, we have a giveaway!! 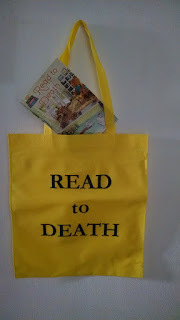 For a chance to win a READ TO DEATH tote and postcard, comment below and tell us anything at all about your favorite library. Please include your email in this format: your name (at) your server (dot) com--so the spambots can't pick it up. Comments close at midnight on Wednesday February 22nd. Hi, it's Terrie here. The e-book of Agatha Award winner WELL READ, THEN DEAD is on sale at Amazon and B&N for $2.99. The next in the series, CAUGHT READ-HANDED, is reduced to $5.99 in e-format. The third title, READ TO DEATH, REMAINS AT $7.99 for kindle but is reduced to $5.84 for paperback only on Amazon. Hooray! All three books at reduced prices. What a wonderful job. I would love to visit. I love all libraries of course, bit my favorite by far are the smaller ones. My library is small, located in Harrow Ontario in Canada. My family is headed to Ft Myers in March for a family wedding and I am going to look up this lovely library! I love all libraries. Some are prettier than others. But the essence of each library is what gives its flavor, the books. When I was a child, we lived out in the country, so we had bookmobiles (one of the best ideas ever). I have worked at a big city library. Then I had the joy of helping start a small town library. We got donated books, and I cataloged, shelved, helped patrons, and generally had an absolutely wonderful time. We got certified by the state and the library is now a community jewel. I moved away before the new building was built, but I am thrilled that things have turned out so wonderfully. I love my library and two features in particular. The first is the digital library service that lets me check out electronic books. No matter the time of day, I can browse and check out something to read. The second is the library's extended lending network. If my library doesn't have a copy of a certain book, I can search and request a copy from one of the other network libraries. In a few days it is available at my home library for me to pick up. Just fantastic service all around. I'd love to have the tote for carrying my books back and forth to the library. My emails is susie30577 at yahoo dot com. Thank you. My favorite library was recently remodeled and I just LOVE it. It's light, open and spacious. It's full of local art by local artists, and they go ABOVE and BEYOND to assist and make you feel at home, on top of having TONS of perks :) Thank you for the super fabulous giveaway! Cheers! Wish I could go there. Maybe the next time I visit my sister in Tampa we'll make a side trip! My favorite thing about the library is that they can order most anything for me so I can always read what is on my TBR list. And when I am in the library I love to see that even though it's a small branch they still have a lot o children's books and those little tables and chair and there are always children using them. I love libraries, especially the older ones. I don't go to the library much any more, but when I was growing up the library was right next to my school,so I spent a lot of time there. My mother was a big reader and would always take us to the library during the summer. My favorite library has a librarian that loves the same books that I do. She always has excellent recommendations for me. I love all libraries. My favorite that I've visited is the Trinity College Library in Dublin. The library I go to also shares a building with the college library. They are always having book clubs and great activities for the children and adults . Their collection is the best around and I use to work there so I may be a bit biased. I haven't been to my local library in a while except for special programs. I love the North Carolina library when I was in college as we went there to work on history projects. We have a brand new, much bigger, library here in town. I visited just this morning. Our Duluth Public library was built to look like a ship because it's located near Lake Superior. It's a great place to come in out of the cold. I loved our library as a kid. The children's section was in a recessed section with huge floor to ceilings Windows. Always a fun place to visit, and check out as much as I could carry. I live in a small town and the library is within walking distance from my house. Love going there and also love the library book sales. 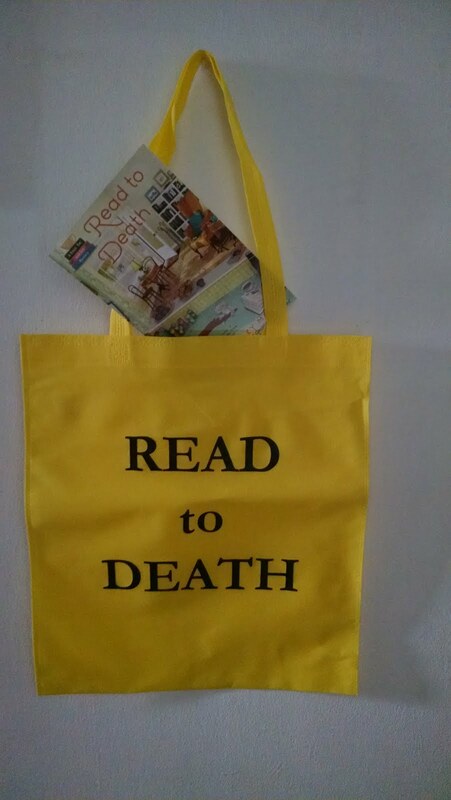 I would love a tote or a chance for the books. I really enjoy our local library. I used to work there as a custodian for 20 years.I miss some of the perks of being there every day. I love that my local library has different sections for different age groups. There is the adult section, the teen section, and then the children's section. Each area also has it's own unique setup with different things to do. How fun! I adore our small library... our son works there as a page (as well as 2 sisters before him) and the kids love the programs there! Shelby Branch of the Lowell Public Library is Da bomb diggity! I love my local library, the best part is their childrens section that helps them realize how wonderful reading books can be. my favorite library was setup in the basement of our Jr. High School. I would go there almost everyday & take out books. I must have gone through about 4 or 5 cards filled up with the books I borrowed during the school year. Giveaway is closed. Many thanks to all who participated winner will be notified by email. I happen to work at my favorite library! I love all of our patrons, and the opportunity to help them! And the winner is....Doward Wilson. Congratulations! !